Alien: Prototype – New Alien Novel Starring Zula Hendricks! I don’t know about everyone else, but I’m feeling a little spoiled! With the announcement of Alien: Prototype, we’re now due for a total of 3 novels this year! Written by Tim Waggoner, Alien: Prototype is also set to feature Zula Hendricks as a main character. This will mark Tim Waggoner’s first foray into the Alien expanded universe but he’s no stranger to science fiction, horror or franchise tie-ins. He has previously written for Stargate, Supernatural, Resident Evil and A Nightmare on Elm Street. Corporate spy Tamar Prather steals a Xenomorph egg from Weyland-Yutani, taking it to a lab facility run by Venture, a Weyland-Yutani competitor. Former Colonial Marine Zula Hendricks–now allied with the underground resistance–infiltrates Venture’s security team. When a human test subject is impregnated, the result is a Xenomorph that, unless it’s stopped, will kill every human being on the planet. 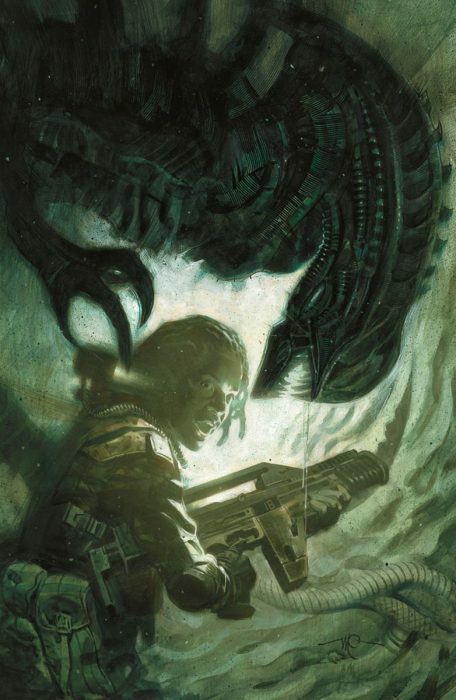 First introduced in the comic series Aliens: Defiance, Zula is also due to feature in a smaller way in Keith R.A. DeCandido’s upcoming Alien: Isolation novel (which is currently slated for a July 30th release). Alien: Prototype is currently available for pre-order on Amazon (US/UK) and is due for release on the 29th of October. Thanks to Felix for the news. Alan Dean Foster Writing Alien: Covenant Prequel Novel, Not Sequel Novel? New Amanda Ripley Comic Announced by Dark Horse! I liked Zula just fine but Davis was the star character. Hope he’s in the novel. It’s actually a white hybrid and is going to kill them all with a sword while spouting Bible quotes. Interesting how Zula caught on and is now protagonist's in several books. Thought she'd be a one and done after Defiance. I did too, but mostly because I thought she was pretty under-utilized in Defiance (especially in the second half). I figured they were just.... done with the character, otherwise they'd have done more with her in Defiance. I mean, for all we know there's only 20 people on the planet and it killed the guy with the gun first. Or it's a babby queen and the race is on to catch it before it nests etc. And . . . ALIEN: PROTOTYPE is off to my editor! Now to begin the hard part -- waiting to hear what he thinks about it. In the meantime, on to the next project. Hopefully it's good, above all else. Nice, new audiobook too hopefully. In regards to timeframe the first clue is "former Colonial Marine". The rest will be revealed when Rescue rolls out. I never really liked Zula. I hope this writer can change my mind. But if it's just a single alien, or only a few, we could have a very interesting novel on our hands. I actually really love her so I'm quite keen to see more of her. I know Defiance took a bit of a downward spiral towards the end but Zula was never a disappointment to me. I'm looking forward to seeing her developed a bit more. Do we think this will be set post-Resistance/Rescue? That's a good question. No way to really know off the synopsis so far. I enjoyed Davis a lot more. Still, even though I didn't quite sympathize with Zula as much as I do with most characters in recent novels, I'll give her this. She feels more real and a lot more interesting than most characters in the recent comics IMO. I'm eager to see if the novel helps with my perception of her since I generally respond more to that medium. Any original alien novel is a must grab for me. If the characters are believable and the alien is treated with care in this one, I'll be thrilled. I would assume it’s set afterwards but post-Defiance/pre-Resistance could also be a possibility. how many "people start experimenting on the xeno" stories do we need? I doubt Zula alone will make this novel worthy. Maybe we will get a great villain or the portrayal of the Alien will make up for it. Unfortunately, it appears the 'PREDATOR' licence isn't as strong it should be. 'The Predator' wasn't anywhere near as good as it should have been. I honestly believe the 'ALIEN' property is strong enough across the board and we'll eventually see a new movie go into production. 'PREDATOR' may take longer. It may not have the popular marketing traction that all the 'ALIEN' EU has. What I really needed was Predator EU to be alive as well. We got 3 alien novel incoming and nothing for predator. No game too. Predator fans are on a limbo. What we really need is a new movie to be announced. I'll take notice of that - the rest is nice and good fun but largely disposable and superfluous to varying degrees. I really want to see another movie but it's good to see the property is so strong across an abundance of licences. That's a healthy sign as far a I am concerned. Glad to see that we’re getting an all new story from Titan. As excited as I am about the Isolation novelization, I’ll always be more excited for something new and original. Content wise 2019 will be a definitive year for the franchise; a new Golden Age if I may be so bold. Interesting! Novels are far more my thing than comics so I'm looking forward to this. Can’t say I saw this coming, but it’s pretty cool. It’s neat to see Titan and Dark Horse working with the same characters. I would guess perhaps the host is something special? Genetically engineered to bring out certain traits with the DNA reflex? Also, sweet to see Zula get her own novel. I am just glad Titan is continuing with new Alien books.